The relationship between siblings is one of the longest and most socially significant bond that exists. And, if one of the siblings has a disability, it’s a relationship that comes with a lifelong set of unique issues—some good, some challenging. In honor of National Siblings Day, we acknowledge the meaningful role these siblings play. They are a vital link to the world beyond family; and yet, their concerns often get overshadowed by the day-to-day needs of their brother or sister. Just like children with special needs, siblings needs support, connection and recognition. 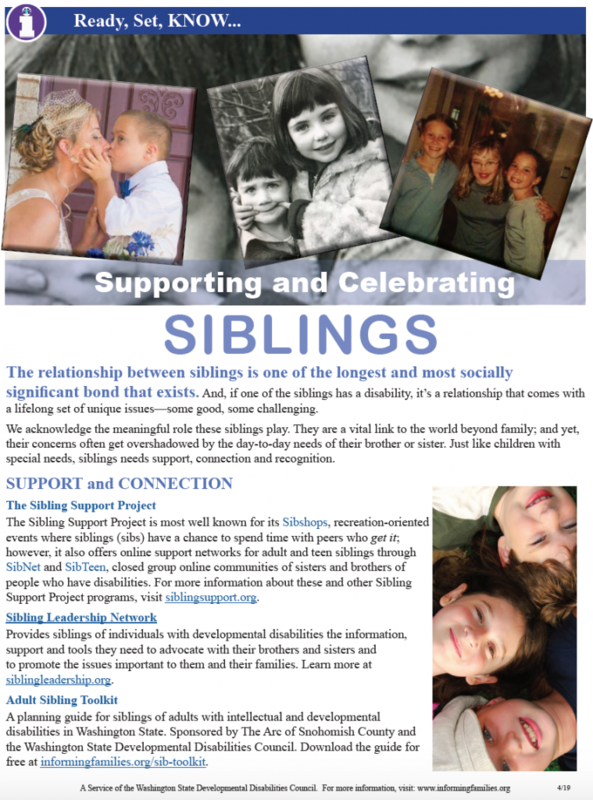 The Sibling Support Project is most well known for its Sibshops, recreation-oriented events where siblings (sibs) have a chance to spend time with peers who get it; however, it also offers online support networks for adult and teen siblings through SibNet and SibTeen, closed group online communities of sisters and brothers of people who have disabilities. Click here for more information about these and other Sibling Support Project programs. Provides siblings of individuals with developmental disabilities the information, support and tools they need to advocate with their brothers and sisters and to promote the issues important to them and their families. Click here to learn more. A planning guide for siblings of adults with intellectual and developmental disabilities in Washington State. Sponsored by The Arc of Snohomish County and the Washington State Developmental Disabilities Council. Download the guide for free.